I knew that George Orwell had worked for the BBC. I did not realize the sheer volume of content he produced in that time. The book George Orwell: A Life in Letters by Peter Davison gives a very full timeline in it's appendices. The BBC themselves have released a number of documents to the public here. It all began in 1941 in the escalating years of WWII. "He wrote 56 newsletters in English to India; 30 in English to Malaya; and 19 in English to Indonesia. Of these, Orwell read 12 to India, 28 to Malaya and 16 to Indonesia. But, in addition, he wrote newsletters for translation: 42 for broadcast in Gujarati; 15 for Marathi; 29 for Bengali; 29 for Tamil; and 1, and possibly more, for Hindustani translations. Thus he composed some 221 newsletters"
In wartime Orwell found himself doing news commentary and educational and cultural programs. While his news commentaries were certainly in the category of propaganda, his educational programs were truly impressive. They covered music, poetry, and a literary dissection of Das Kapital. He also wrote plays dramatizing writings by Anatole France, Ignazio Silone, H.G. Wells and Hans Christian Andersen and sponsored programs of local Indian theater as well. In this period he was their "Talks Producer" in the Eastern Service working for Zulfaqar Ali Bokhari. Bokhari is as distinguished and legendary a radioman as ever existed in India. He was a graduate of Oriental College and with a Munshi Fazil (honors). He was a teacher, a translator and also worked at the bureau of translations. In 1935, one of his own students recruited him to work at All India Radio, later known as Akashvani. So at the time Orwell was hired, his supervisor only had 6 years of experience over him. Though Orwell, born in 1903, was actually slightly older than Bokhari who was born in 1904. 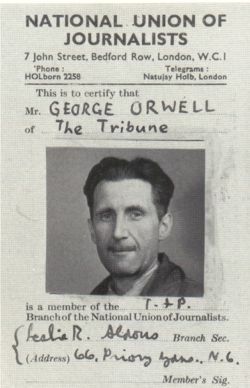 When Orwell quit in 1943, he wrote in his letter of resignation that he had been "allowed very great latitude" and was never "compelled to say on the air anything that I would not have said as a private individual." Despite that biographers often interpret the Ministry of Truth from his book Nineteen Eighty Four as a metaphor for the BBC. More here.